Info "Let's hear it for shish kebabs! Yaaaaaay!" Stick It Through 'Em! is one of Kat and Ana’s Microgames in WarioWare: Smooth Moves. There will be three pieces of food. The player must skewer all three of them when they're in line. 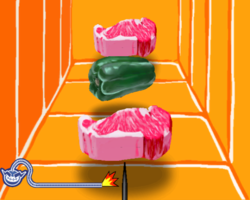 1st level difficulty: The player must skewer stationary pieces of meat and bell pepper. When the game is won, a muscle man eats the food. 2nd level difficulty: The player must skewer three apples that move a little. When the game is won, three muscle men appear wearing apple helmets. 3rd level difficulty: The player must skewer three comets, which are moving fairly quickly, using the nose cone of a rocket. When the game is won, the muscle man rides away holding onto the rocket, and his face appears in space. This page was last edited on August 26, 2018, at 11:43.